I had a meeting with representatives from the borough’s town centre partnerships early in the week which, I thought, was useful and generated a lot of ideas and issues for the council (and the town centres) to take away and work on. The different character of the five town centres is one of the defining characteristics of Wandsworth and help give the borough its heart soul. There is nothing worse than an out of town shopping centre (having spent a large part of the day at Westfield, I’m glad we have never gone down that route). It’s easy for a council to concentrate on its residents and not think about the businesses needed to serve the people who live there and provide jobs for local people. While I think we generally do a good job I know we don’t always get it right and am pleased the partnerships are prepared to tell us when we don’t! 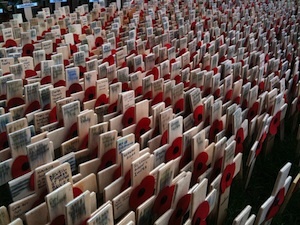 I took my son along to the Act of Remembrance in Battersea Park on 11 November. As always it was a moving ceremony that involved not just those affected or involved in the armed forces, but also local children. And while I do get a little annoyed at the few dog-walkers who cannot pause for a moment at 11am, it was good to see most people in the park taking a few minutes to those who have sacrificed so much for us all. Another defining characteristic is the council’s commitment to volunteering and giving some recognition to those who have given so much to their community. One of the year’s highlights for this is the Civic Awards which seek to recognise a handful of people each year who have given, voluntarily, huge amounts over the years to the area. Wednesday saw five awards made to those whose lifetime of commitment had made a difference. It was an opportunity for the council to say thank-you, and for the recipients, their friends and families to celebrate. And one of those nights that really shows that the council is, and should be, about so much more than just providing services. Finally, I spent yesterday in Roehampton at a conference organised by the police (with some help from the council’s Community Safety Division) about the different factors affecting confidence in the police in the borough. You might, superficially, think it is just a function of the police themselves – but there are so many factors that affect what people think about safety in the area. We happen to have excellent police, but many other factors seem to determine how people think. For example, many ‘communities’ within the borough have different views because their access is restricted, not deliberately, but because people haven’t thought about their situation. There were some powerful presentations given, I was particularly touched by two ladies who discussed their experiences of interacting with the police when they were victims of domestic abuse. It is a recurrent theme for me, but it is important to realise that things are very very rarely as clear-cut as they might seem.